September 31st, 2018 - Wuv! Twoo Wuv! Casye and Elizabeth decided to pay tribute to their good friend, Taylor! She just tied the knot in a Princess Bride Themed wedding. The movie is absolute perfection. Both girls could probably quote it word for word if you asked them too. But how's the book? Not sure. 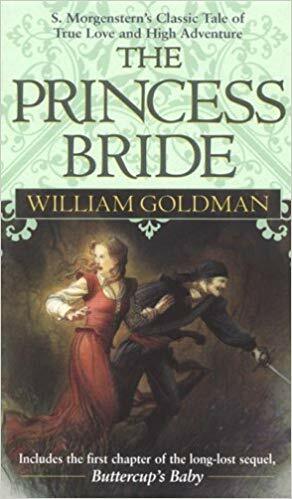 So we read The Princess Bride by William Goldman. Sometimes you find the right book at the right time of your life that helps you get through some tough things. This is not that book for Elizabeth. William Goldman desperately tries to find his favorite story for his son. It's the classic tale of true love, swordplay and adventure; S. Morganstern's The Princess Bride. Buttercup is a beautiful farm girl who falls in love with the farm hand, Westley. After Westley goes to find his fortune, he is killed by the Dread Pirate Roberts. Buttercup is then set to marry Prince Humperdinck, but things go horribly wrong when 3 strangers kidnap her in the woods. Who is this man in black chasing them? Will true love win the day? Seriously, how have you not seen this movie? Go watch it! Now!